Patti Diamond / Special to the Pahrump Valley Times Homemade chips are simply delicious and easier to prepare than you may think. They have more potato flavor, and when baked they’re practically virtuous, lower in calories and higher in nutrition than mass-produced chips. Now, I’m not knocking store-bought chips. In fact, open a bag of BBQ chips in front of me and I’ll follow you anywhere. But if you’ve never made potato chips from scratch, you must try it. Homemade chips are simply delicious and easier to prepare than you may think. They have more potato flavor, they’re obviously fresher, and you can season them any way you wish. You can fry or bake them. When baked they’re practically virtuous, lower in calories and higher in nutrition than mass-produced chips. And they cost less. For the cost of a few potatoes, you get a big batch of chips. Truly frugal and fabulous! When you choose to fry using a pan on the stovetop, you’ll need a deep-fry or candy thermometer to closely monitor your temperature. As you fry keep adjusting the range dial as the temperature will drop when you add new batches of potato. You may have to pause and raise the temperature of the oil between batches. Alternatively, you can use a deep fryer or electric skillet which regulates the temperature for you. Pour enough oil into a heavy-bottom pan or Dutch oven to fill it about halfway. Heat the oil over medium heat until the temperature reaches between 350°F degrees and 375°F degrees. While the oil is heating up, slice the sweet potatoes using a mandolin set at 1/8 of an inch, although a sharp knife and a patient hand will also work fine. Once the oil is hot, working in batches, place a handful of the sweet potatoes into the oil and fry for a few minutes, stirring often until golden brown and crisp. Use tongs, a spider strainer or a slotted spoon to transfer them to drain on paper towels. Season immediately with salt or use BBQ seasoning. Repeat the process with the remaining potatoes. 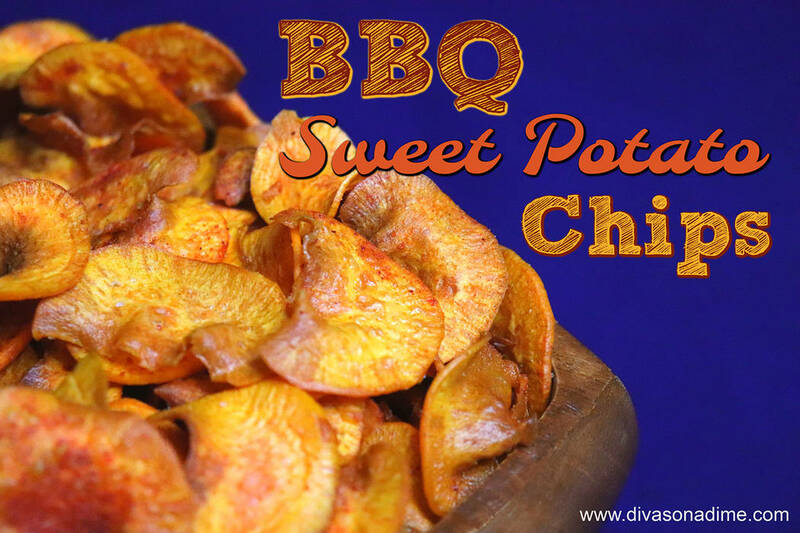 Awesome BBQ Potato Chip Seasoning: Stir together; 1 tablespoon smoked paprika, 1 tablespoon brown sugar, 1 teaspoon kosher salt, 1 teaspoon chili powder, 1 teaspoon garlic powder and ¼ teaspoon cayenne pepper. To bake potato chips: Preheat oven to 400°F degrees. Lightly grease two or more baking sheets with cooking spray and set aside. In a large bowl toss potato slices with a tablespoon of olive or vegetable oil. Arrange potato slices them in a single layer on prepared baking sheets. Bake, flipping once, until edges are crisp, 20 to 25 minutes. Season immediately. In theory, these chips will stay fresh for three days stored in an airtight container. They never last three hours in my house. If you manage to store them for three days and it works, let me know. Here’s hoping your team make the final four! See you next week!